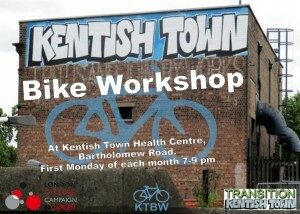 Kentish Town Health Centre, 2 Bartholomew Road Kentish Town London NW5 2AJ . You can sign up for monthly notifications. 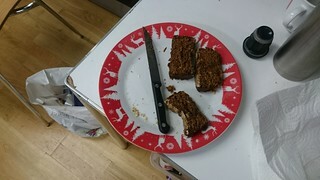 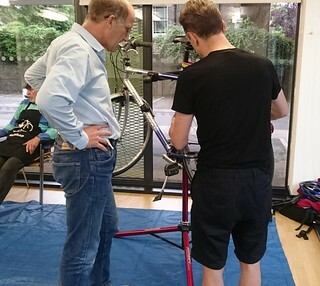 I was nervous about attending and I'm not a serious cyclist, but I was made to feel very welcome and treated with the utmost respect. 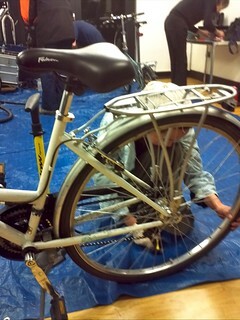 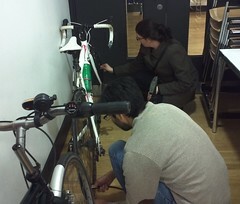 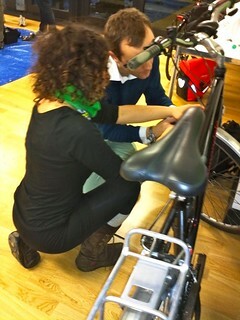 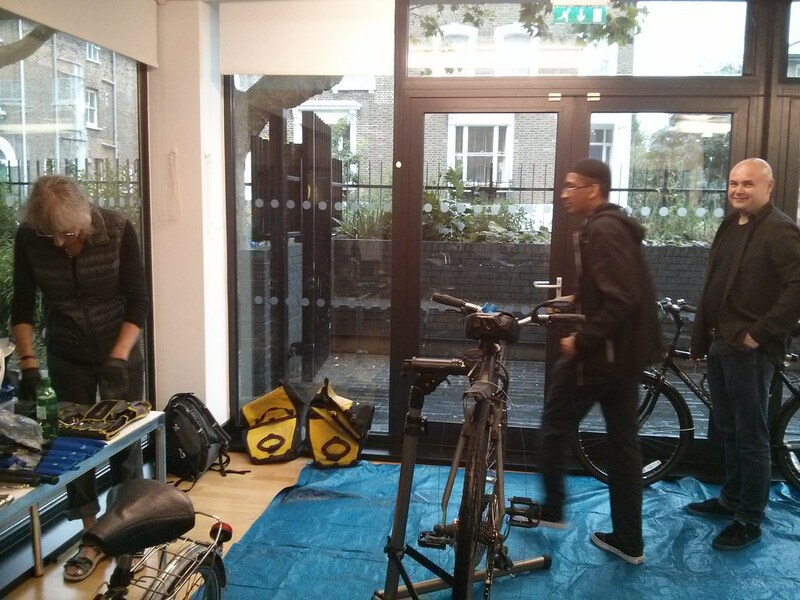 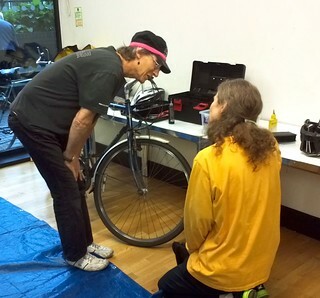 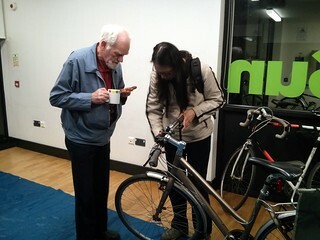 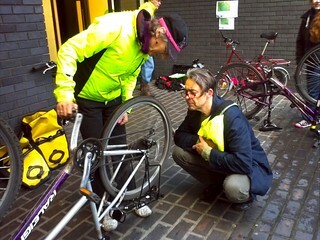 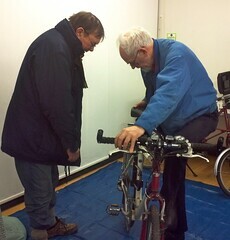 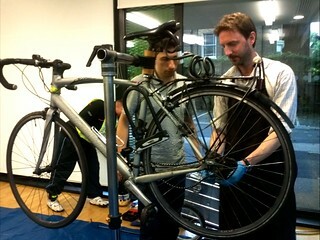 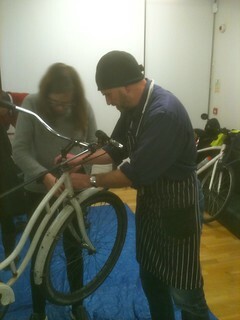 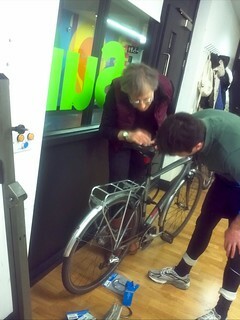 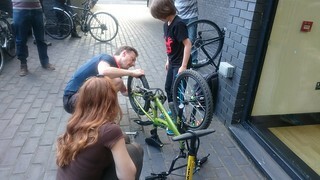 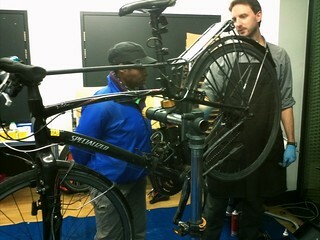 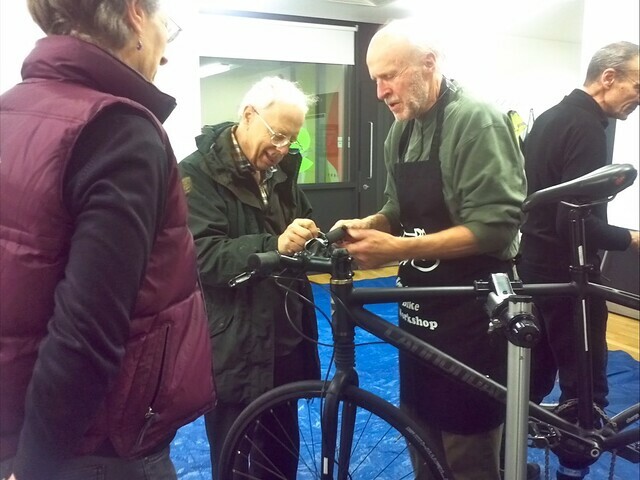 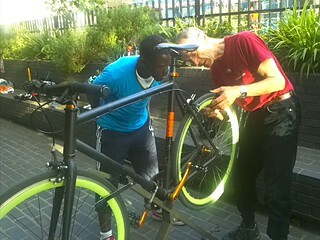 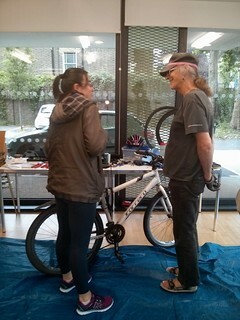 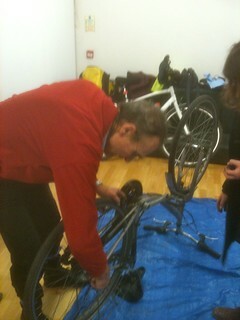 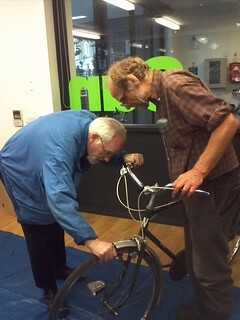 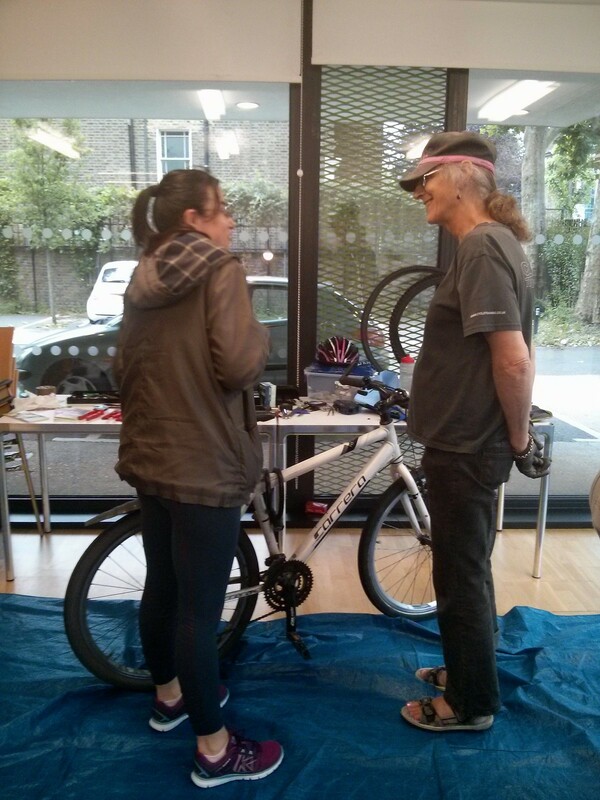 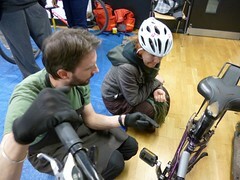 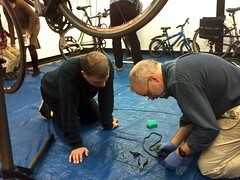 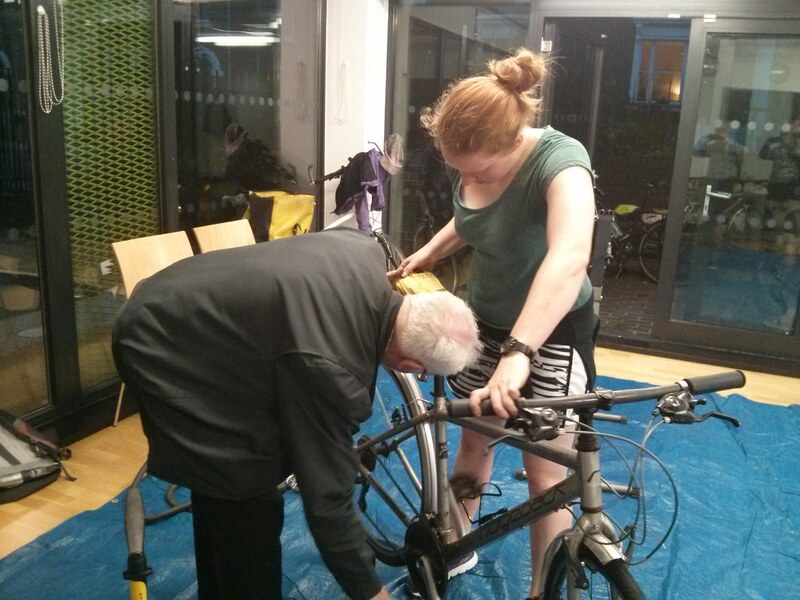 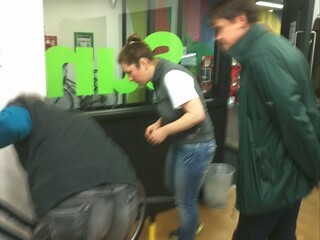 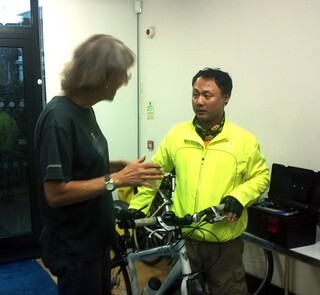 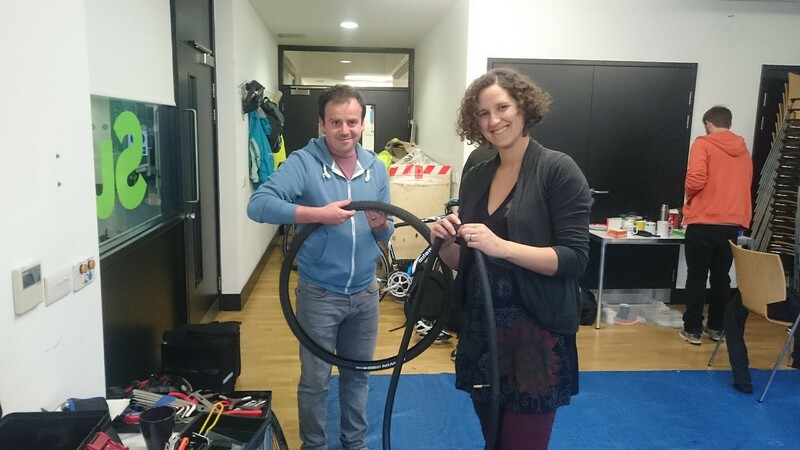 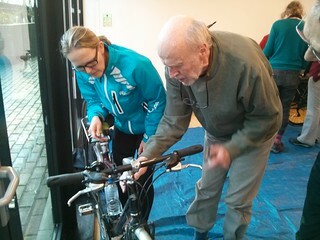 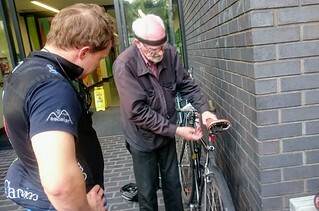 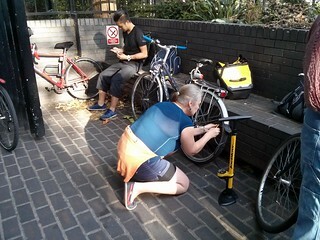 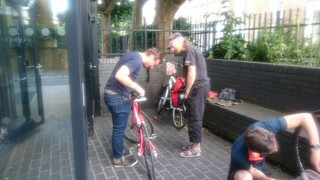 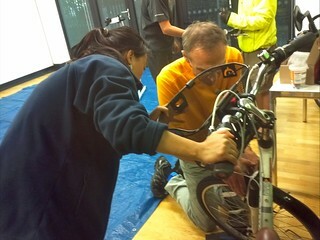 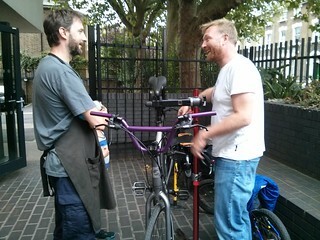 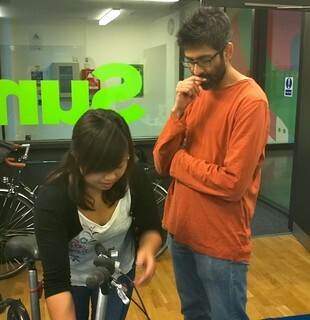 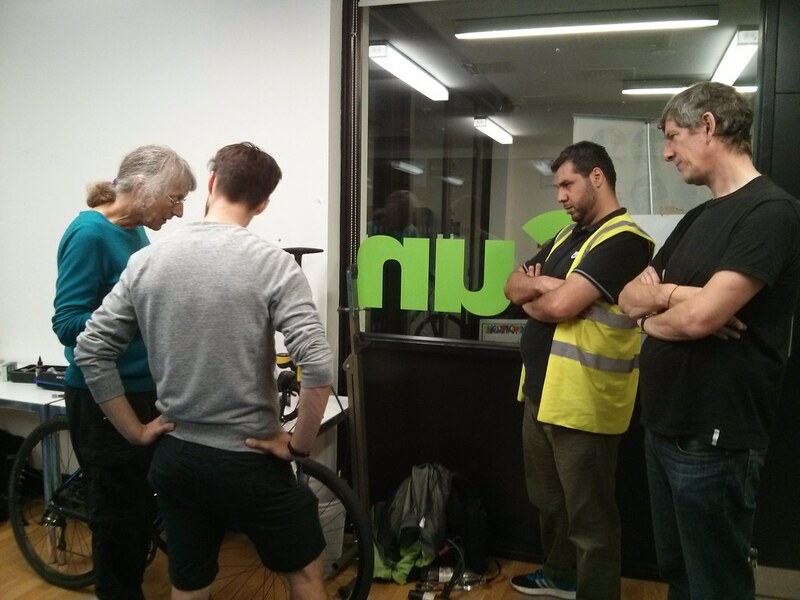 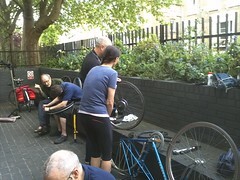 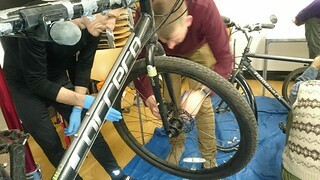 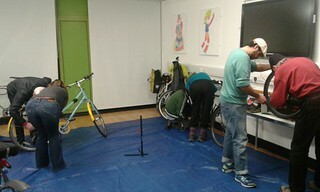 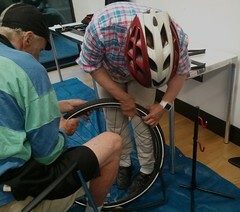 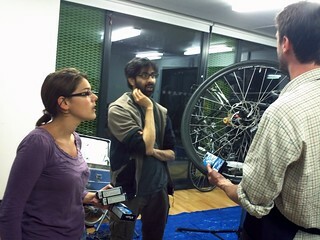 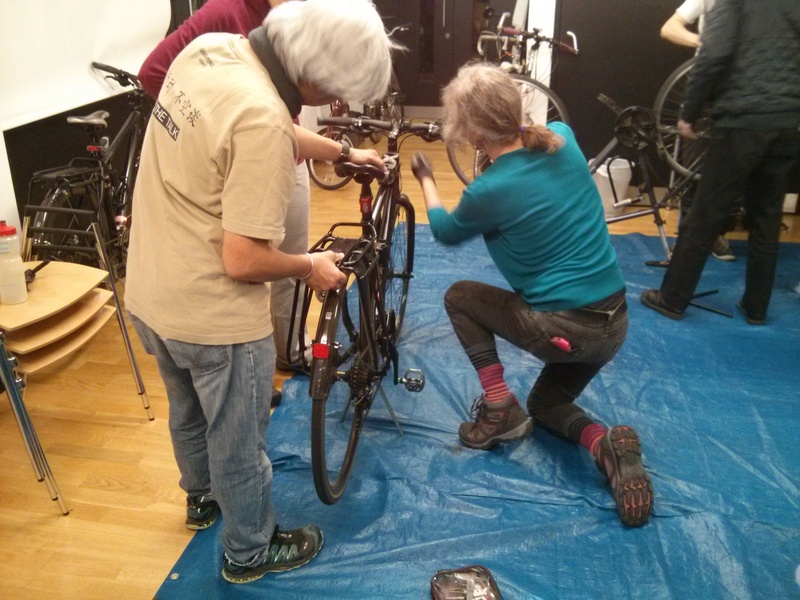 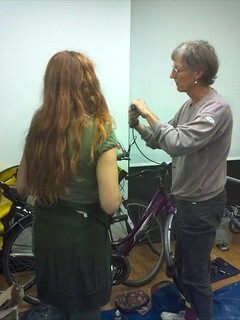 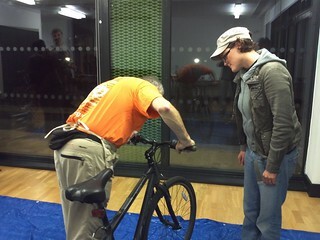 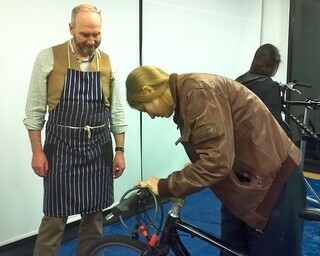 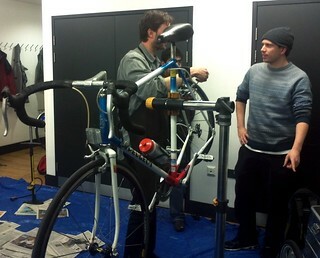 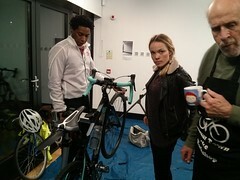 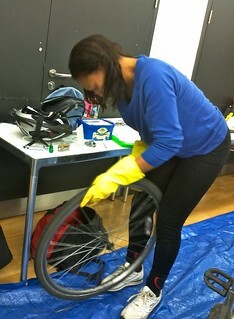 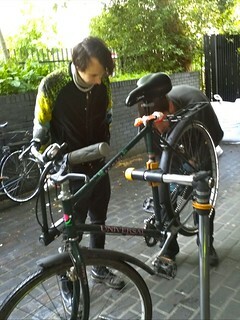 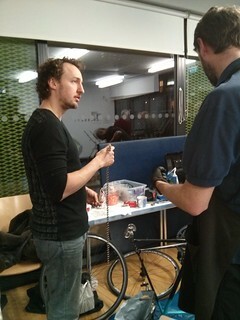 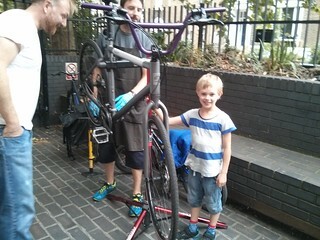 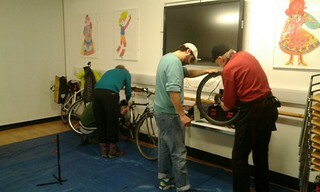 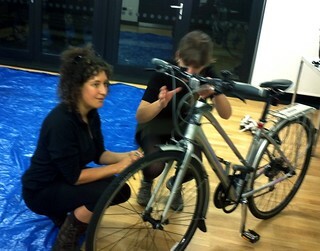 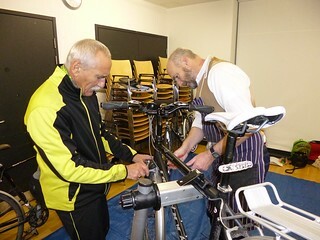 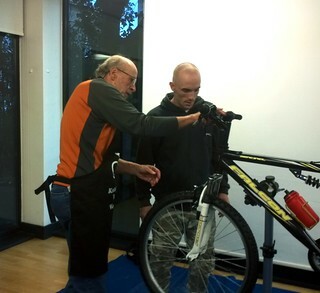 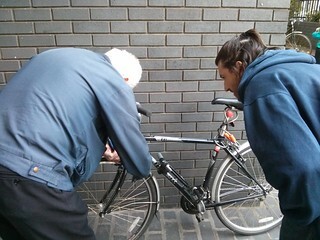 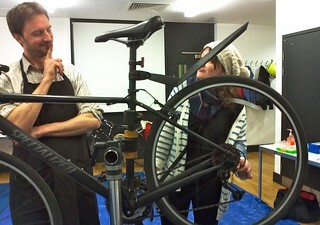 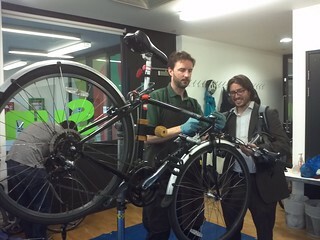 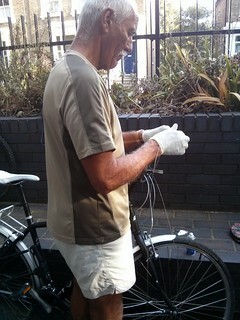 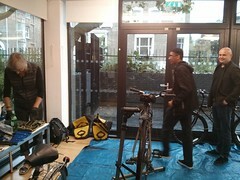 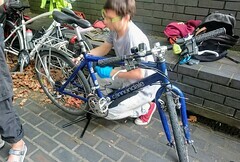 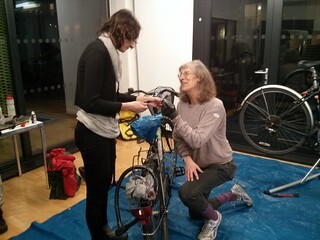 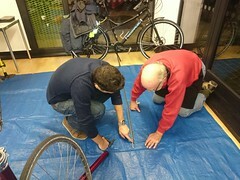 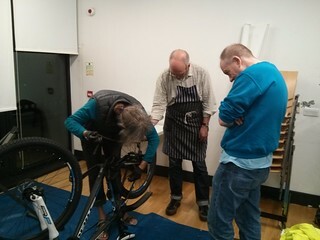 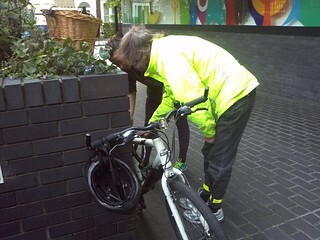 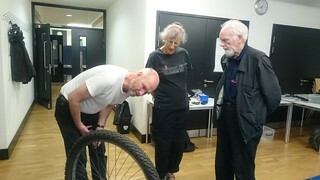 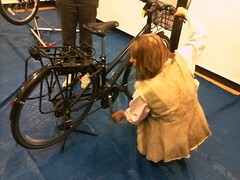 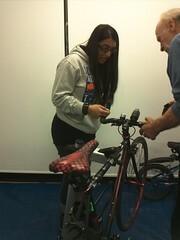 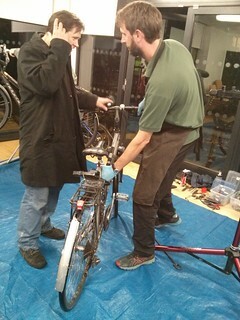 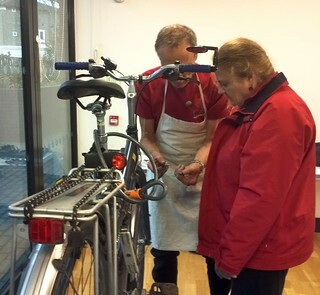 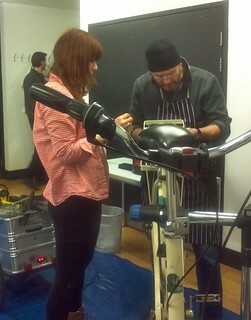 As well as making me feel welcome, they helped fix the problems with my bike and I learnt a few things as well. 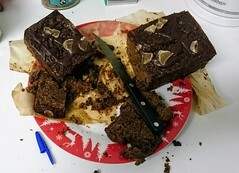 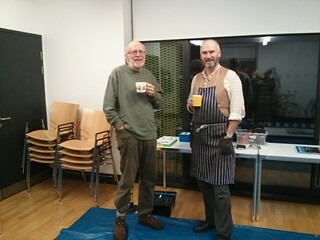 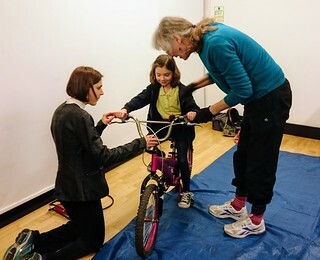 The workshops are free but donations will be welcome. 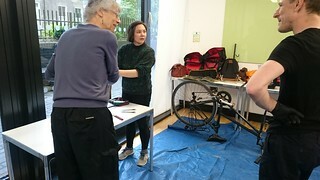 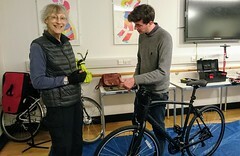 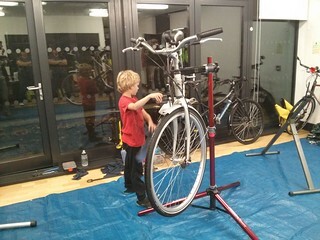 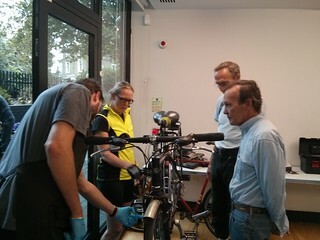 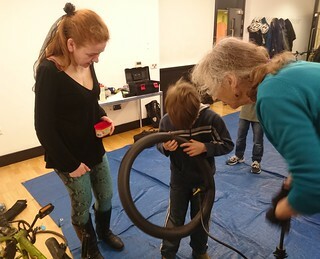 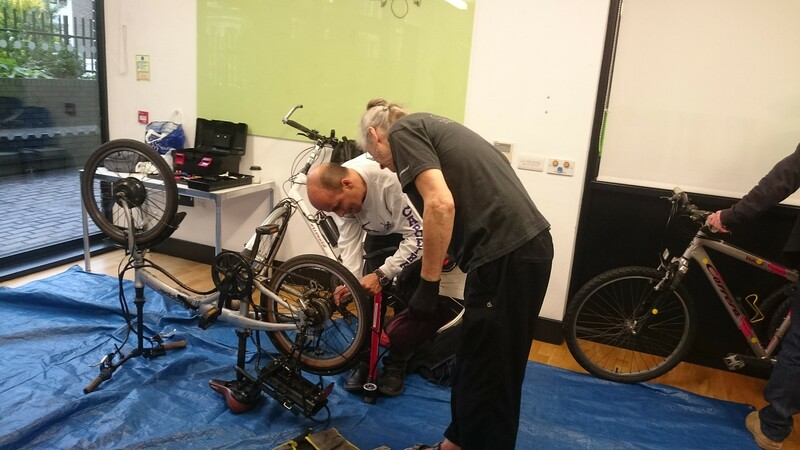 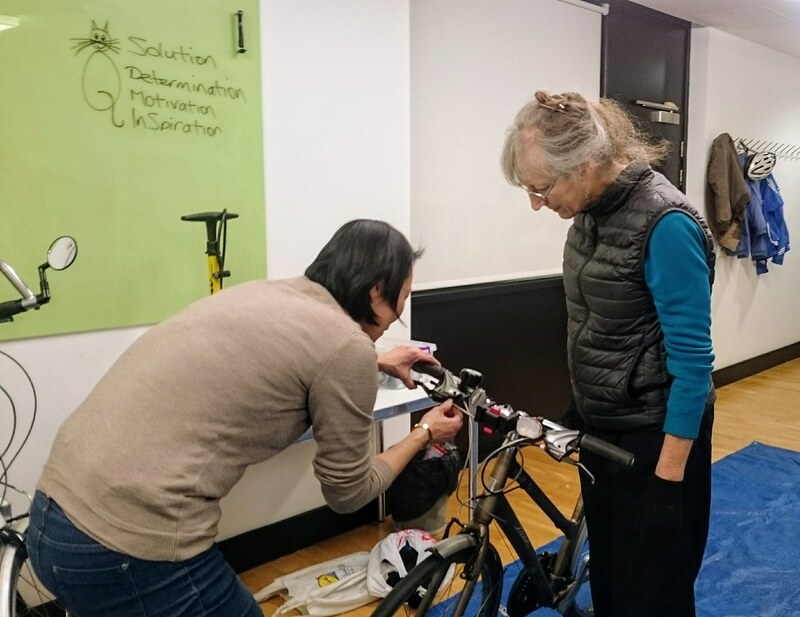 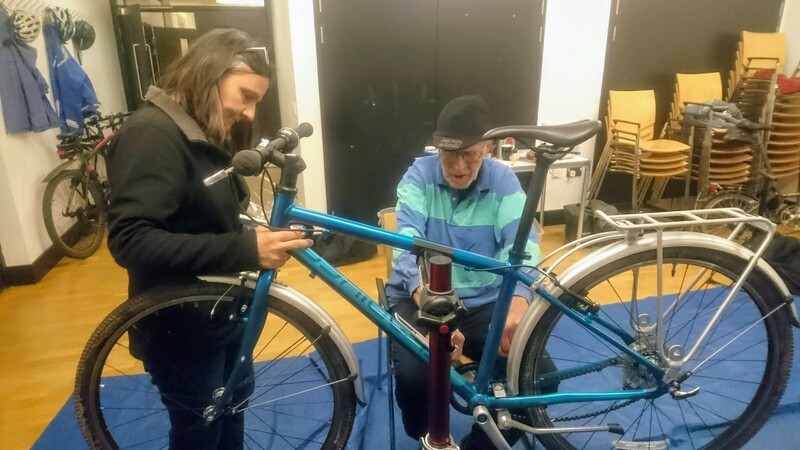 Our Dr Bikes are unable to provide advice as to the functioning or otherwise of the electric motor, controller or battery on a power-assisted bicycle. Although we can help with maintenance of the brakes and gears and other parts we will decline to do anything that may disturb the functioning of the electrical components. For example, it may be difficult to change brake cables without disrupting electrical connections. 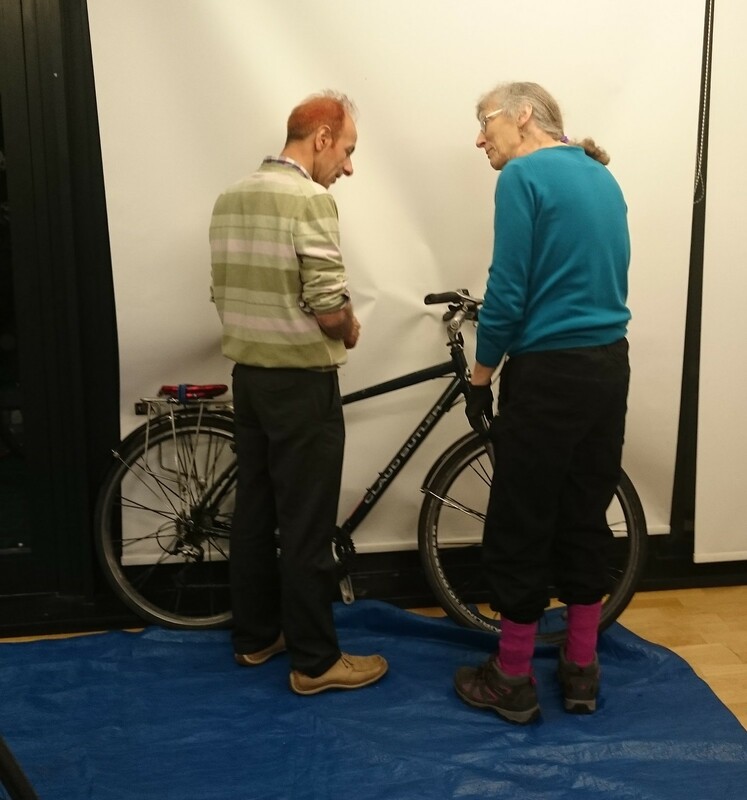 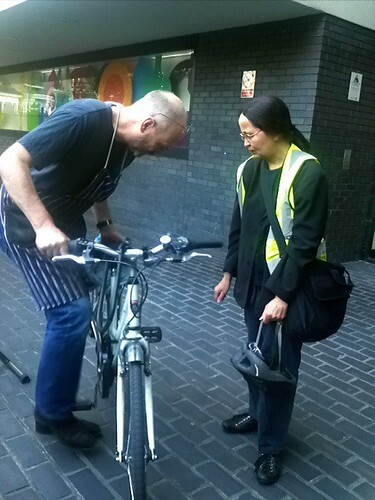 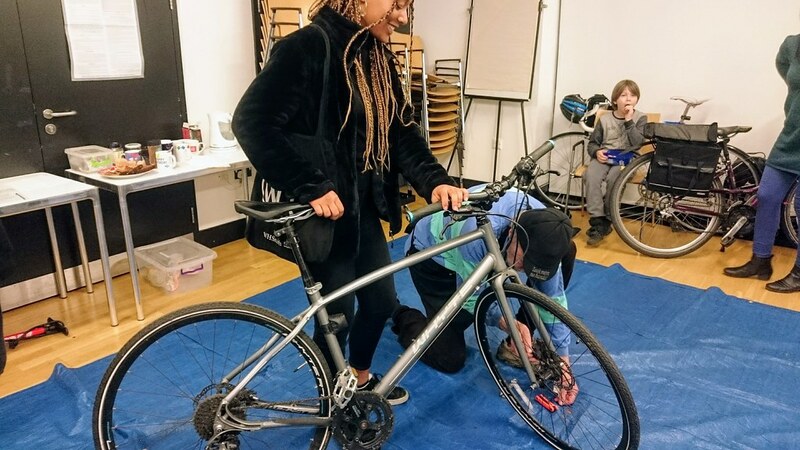 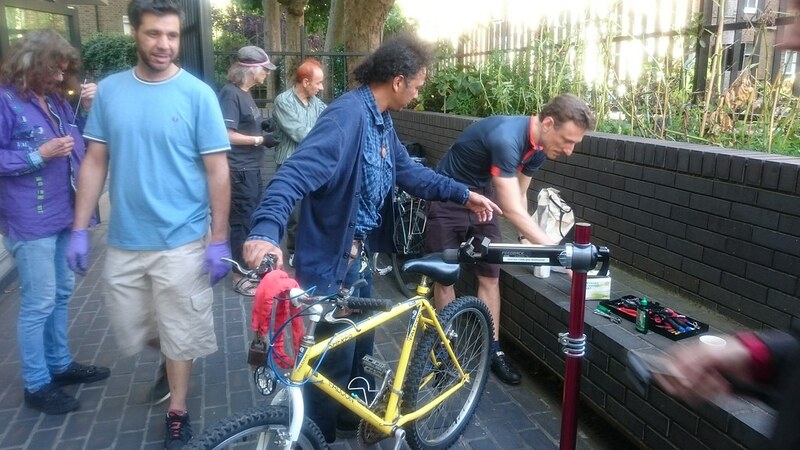 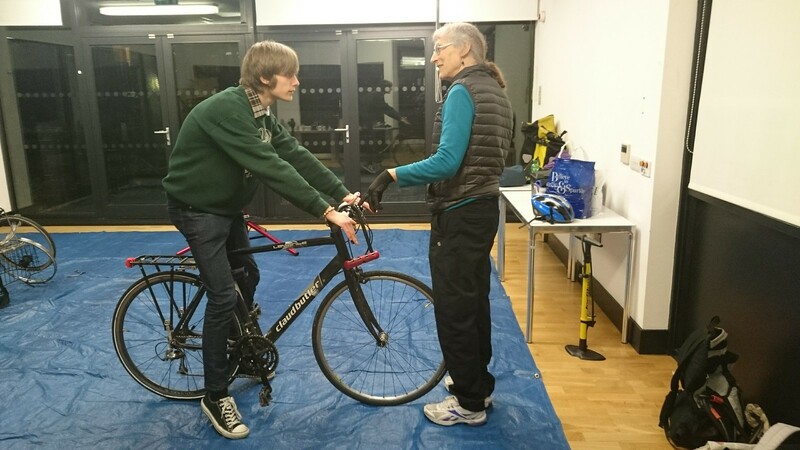 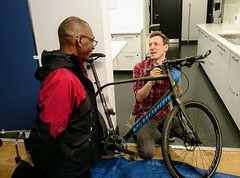 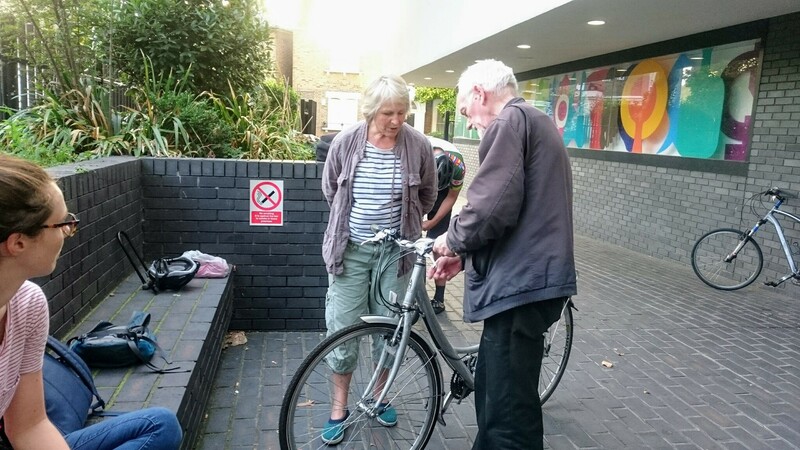 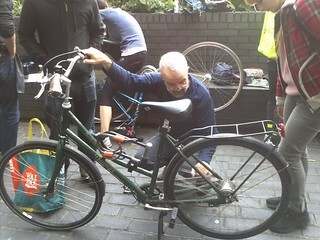 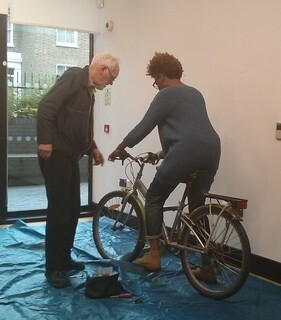 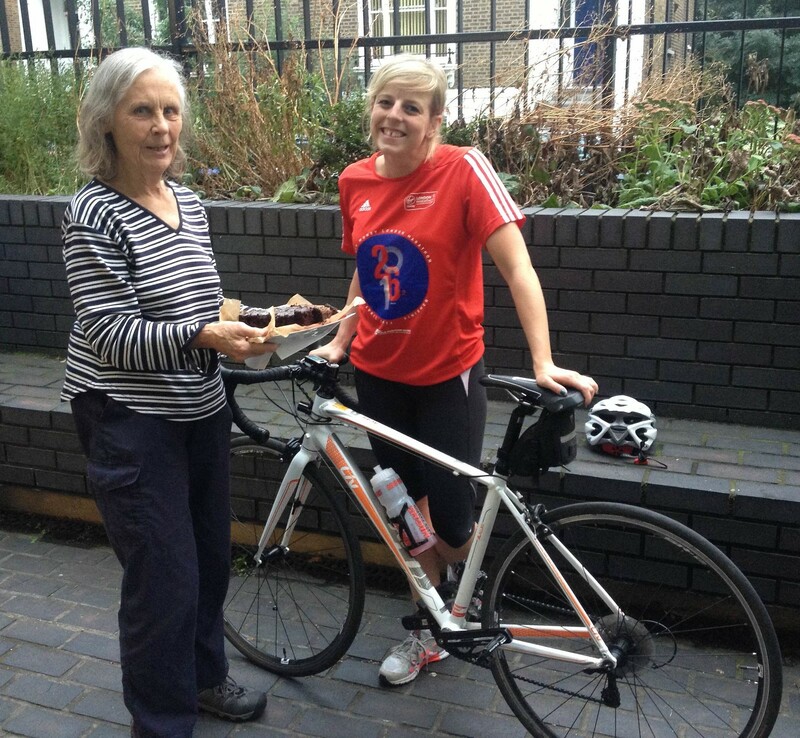 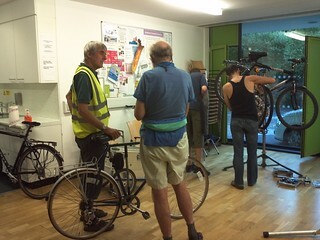 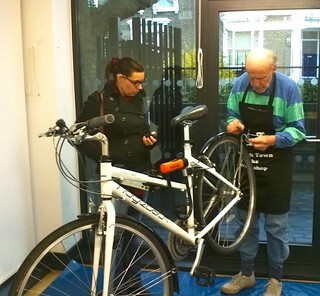 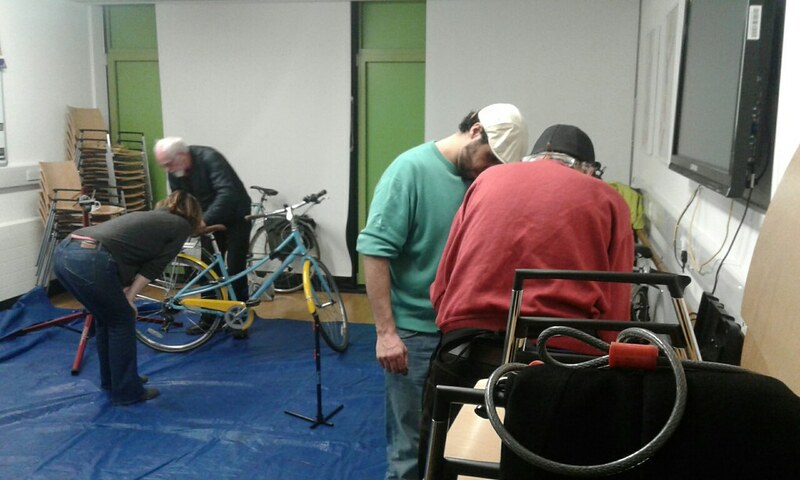 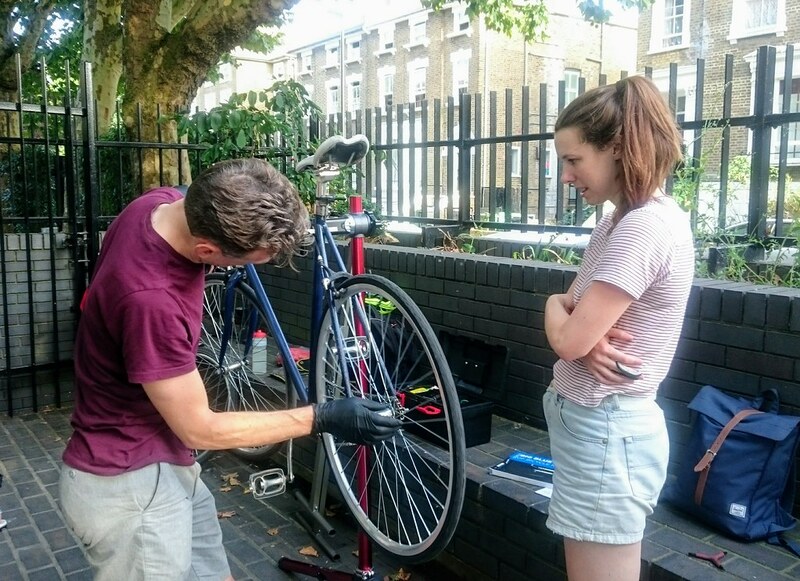 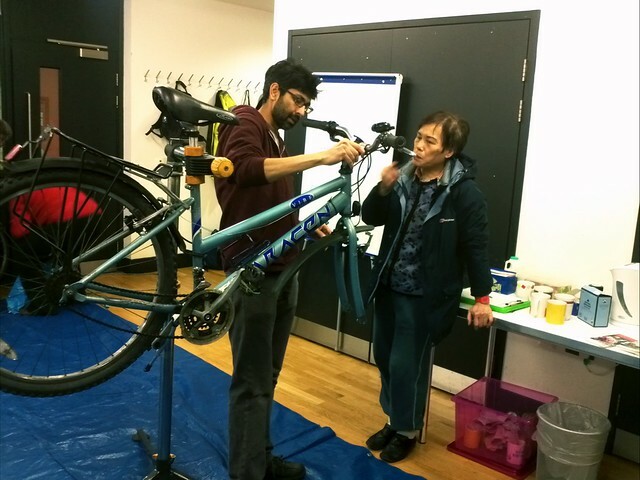 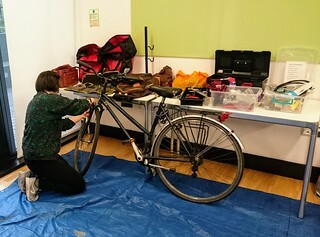 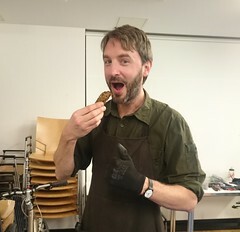 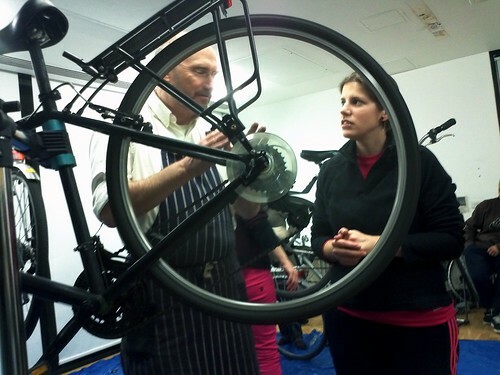 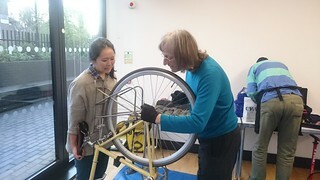 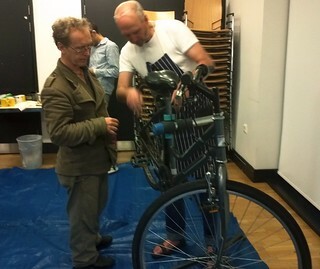 Although we were able to give the first unused bicycle to TKT to use with a trailer for Vegbox for delivering vegetables every week to pick up points, we are not able to accept donations of bikes and parts for lack of space. 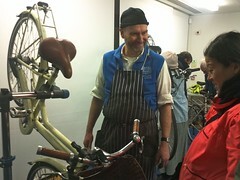 Thierry at Underground Bicycles . 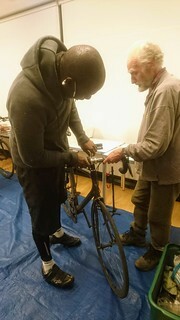 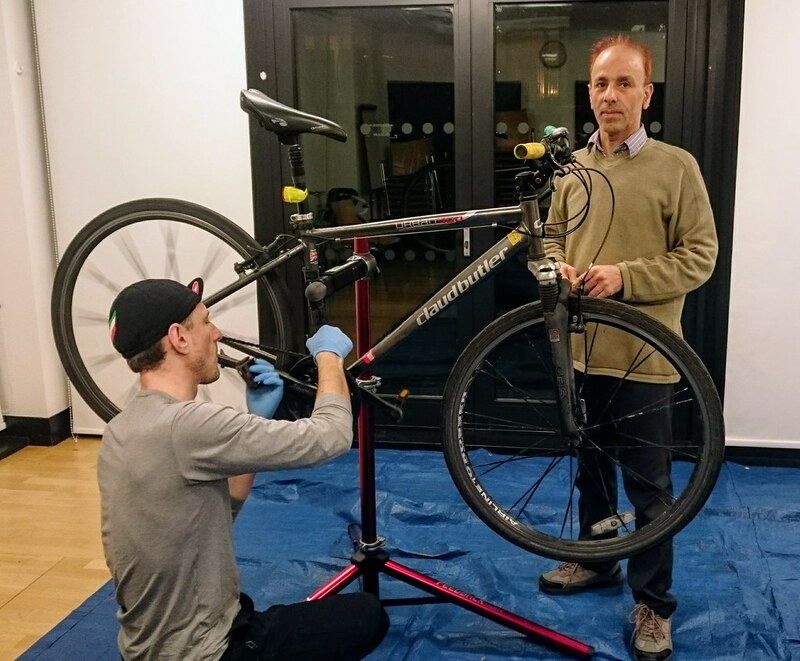 Thierry (phone 07551209377 or 07729 320399) is also a source for cheap repairs, possibly including electric bikes and second-hand bikes. 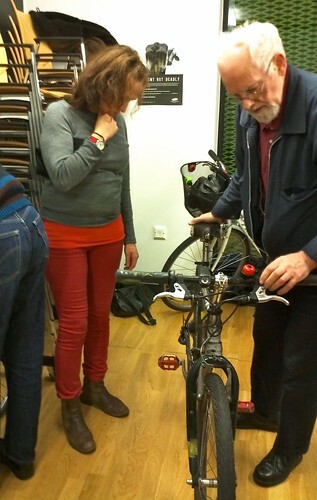 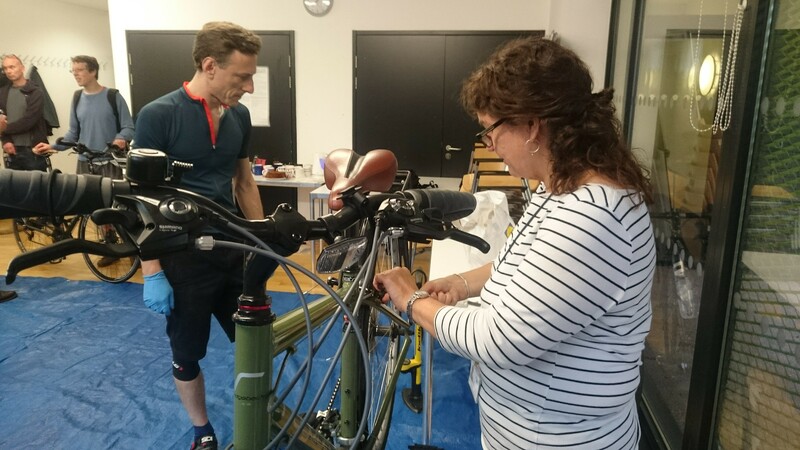 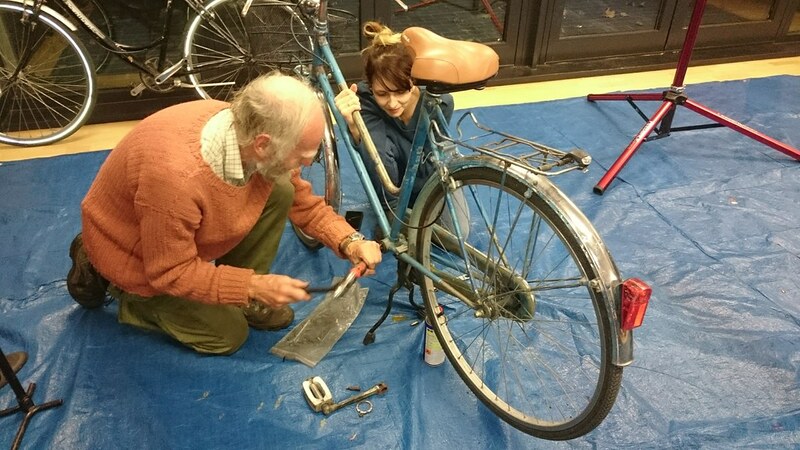 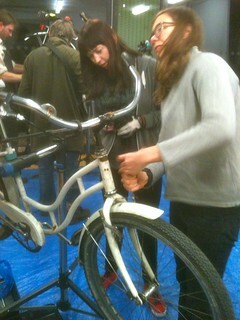 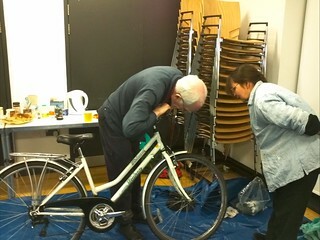 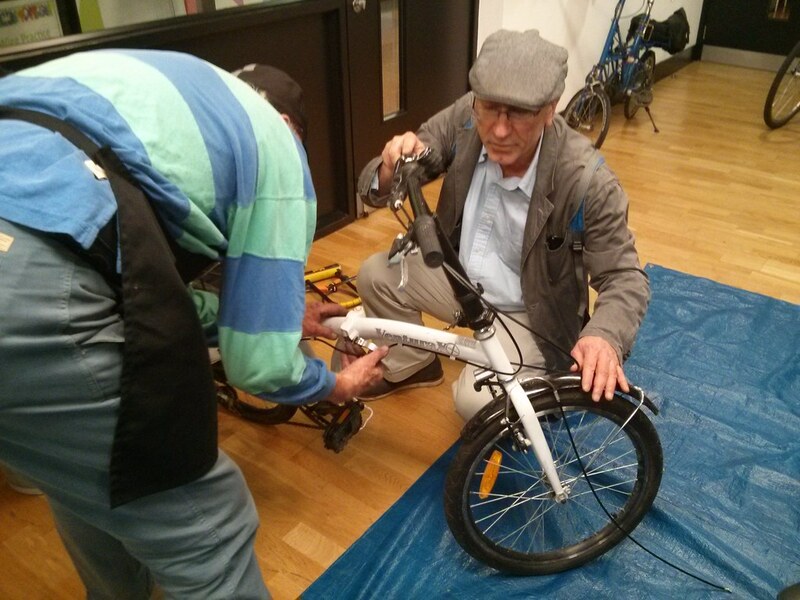 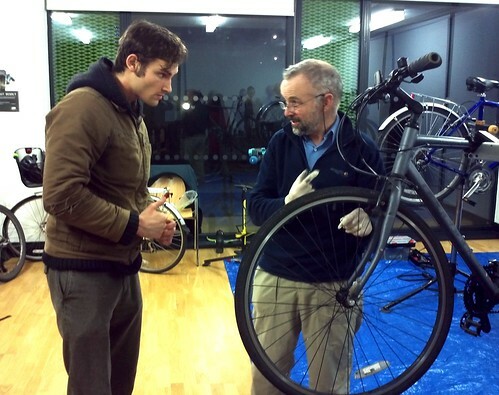 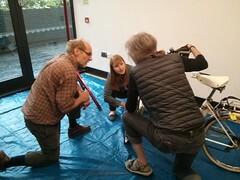 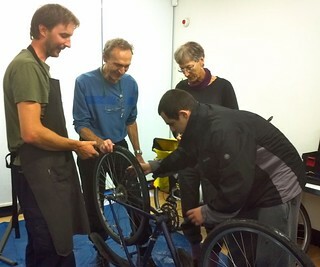 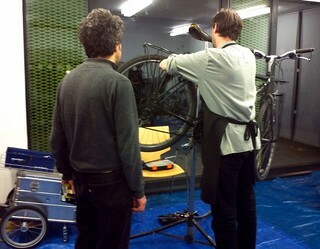 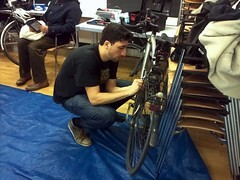 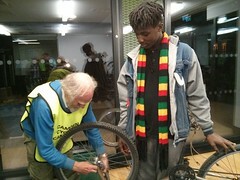 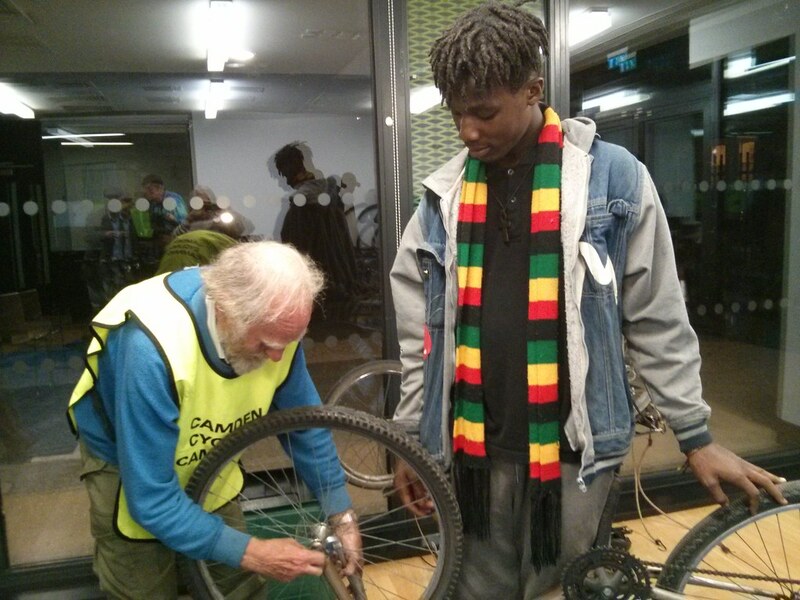 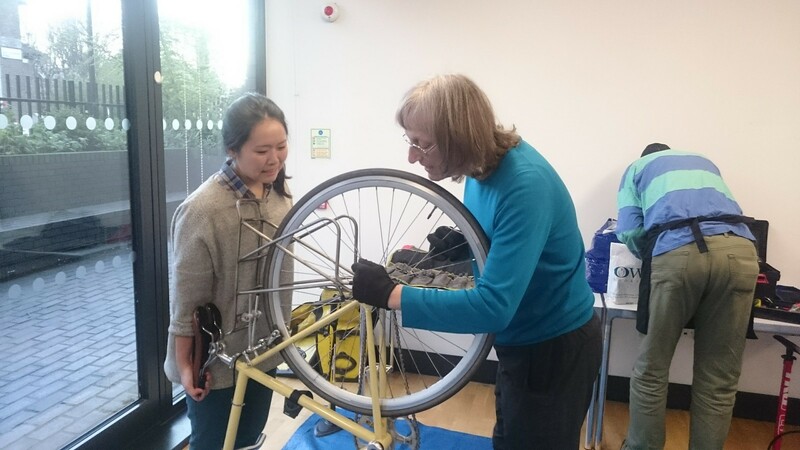 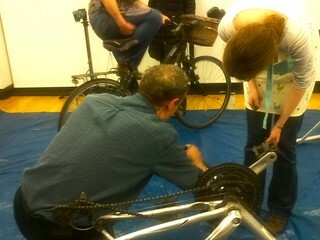 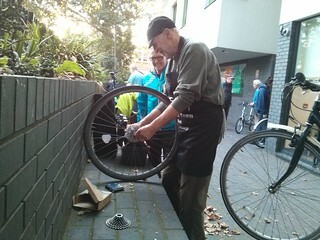 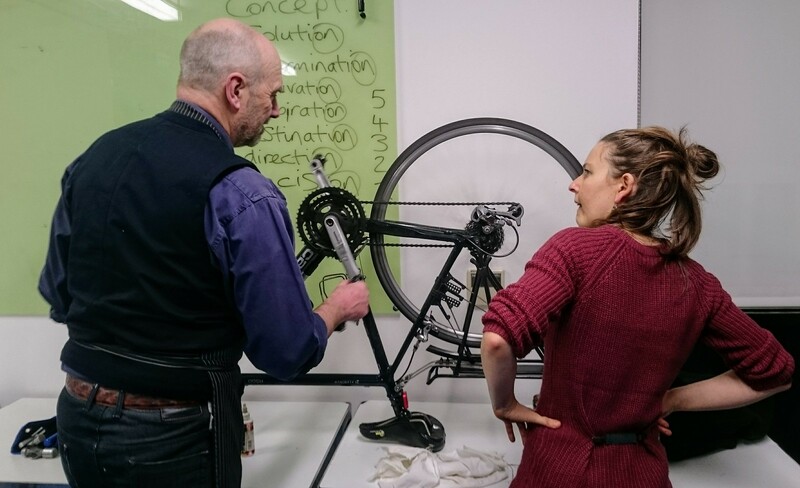 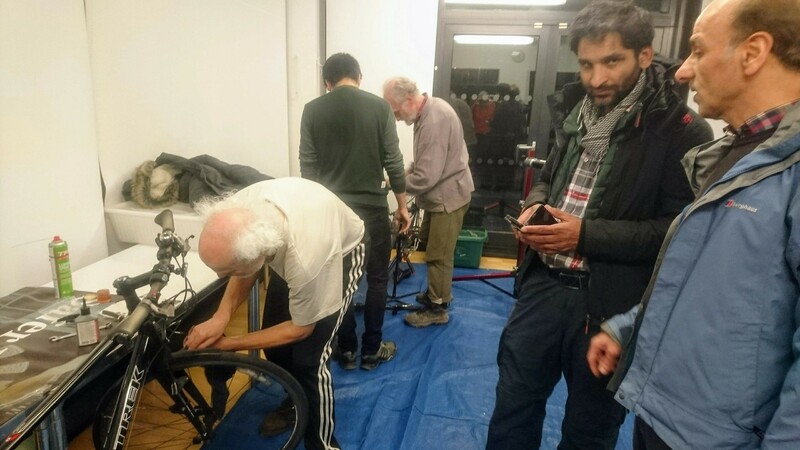 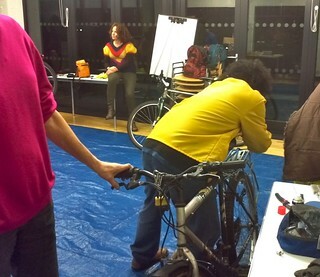 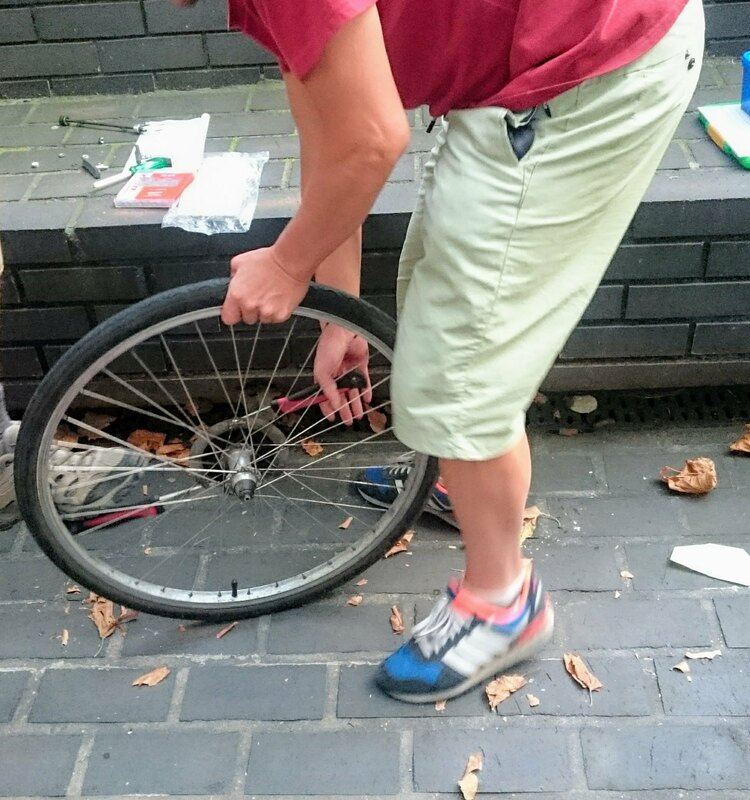 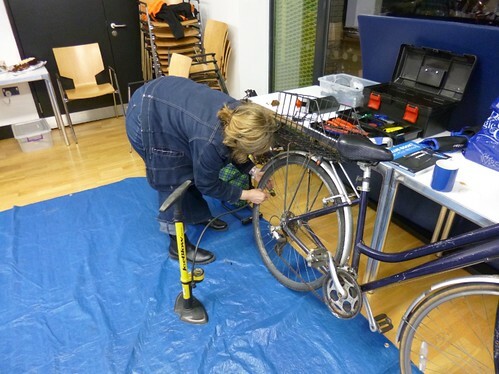 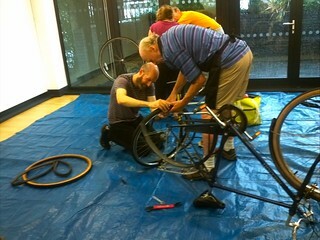 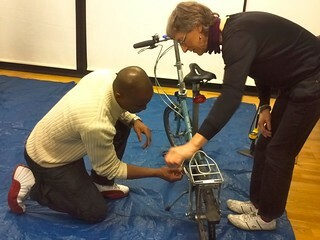 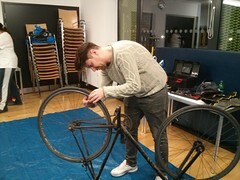 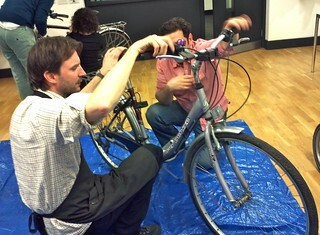 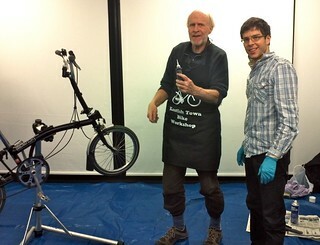 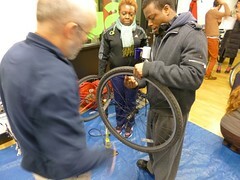 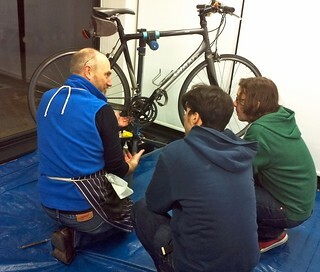 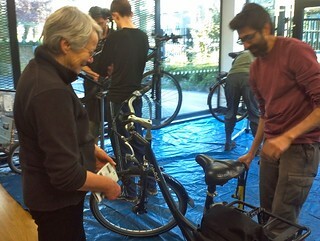 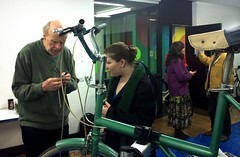 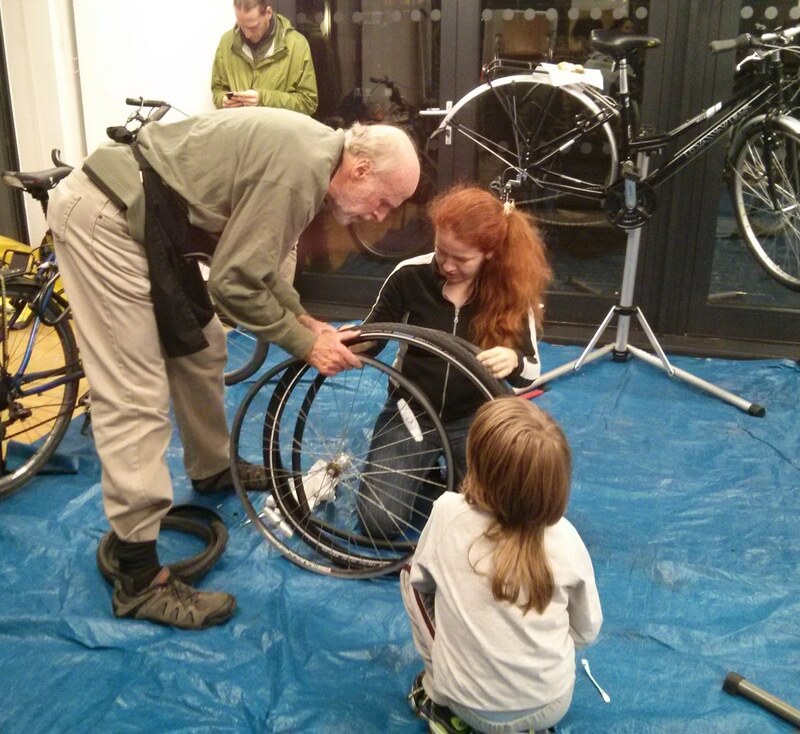 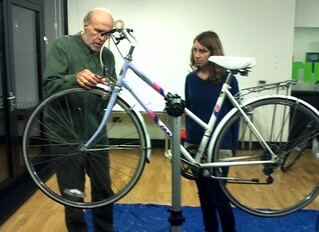 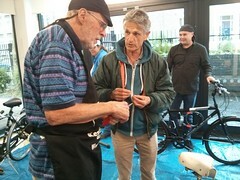 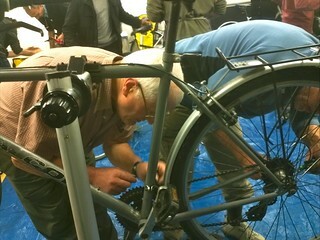 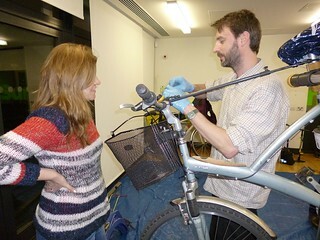 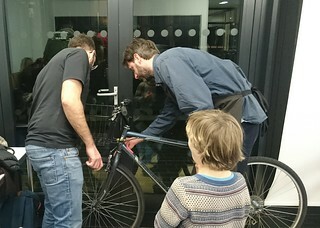 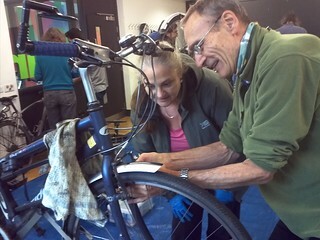 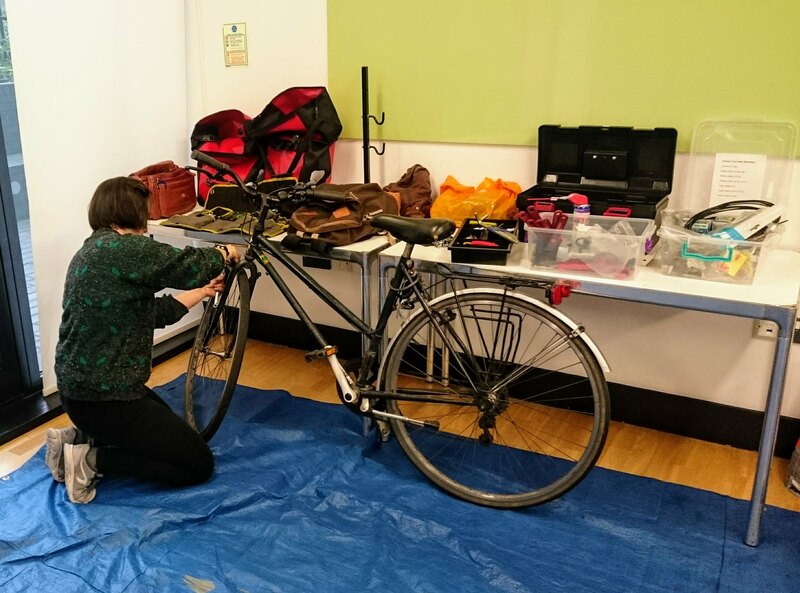 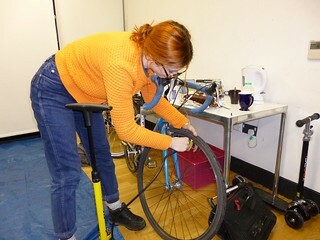 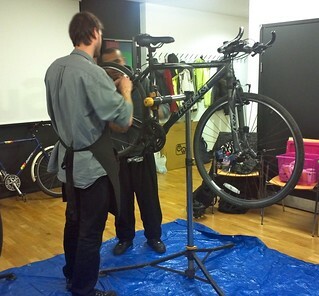 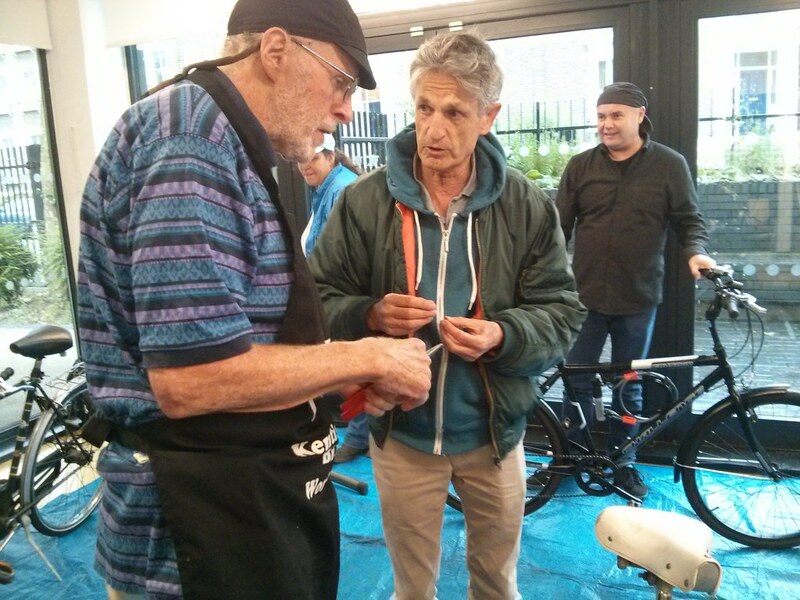 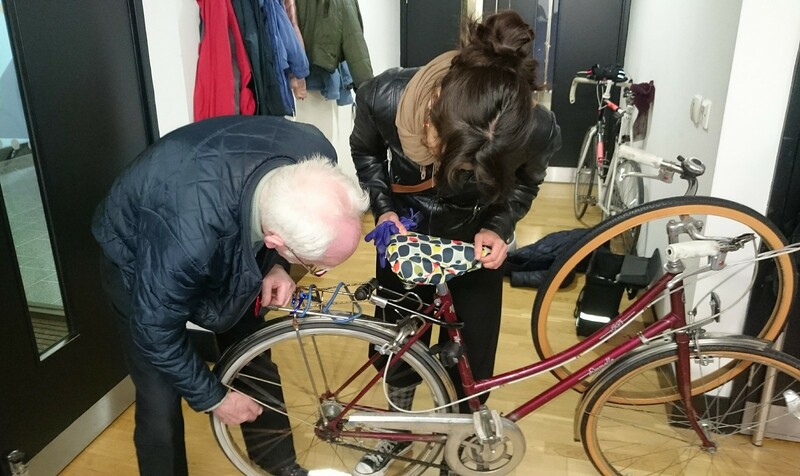 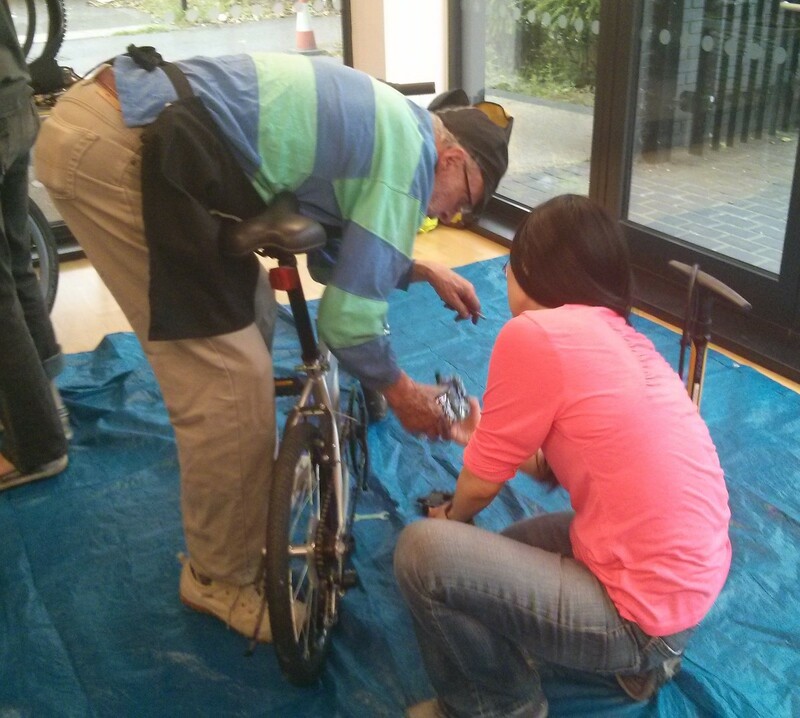 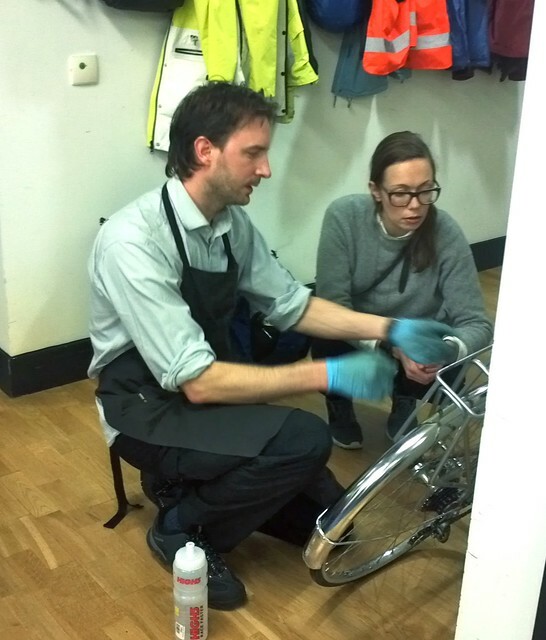 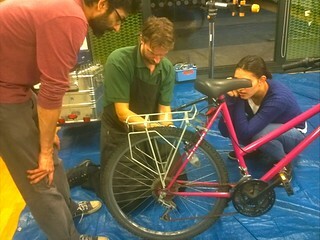 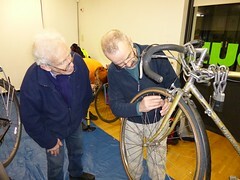 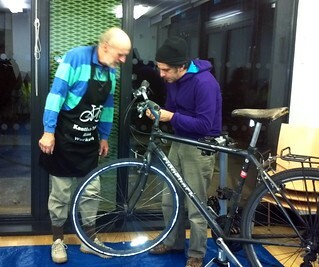 The Bike Project takes second-hand bikes, fixes them up and donates them to refugees and asylum-seekers. 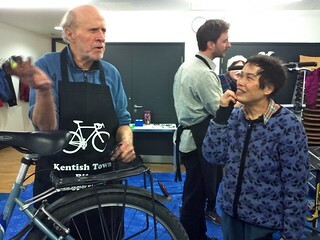 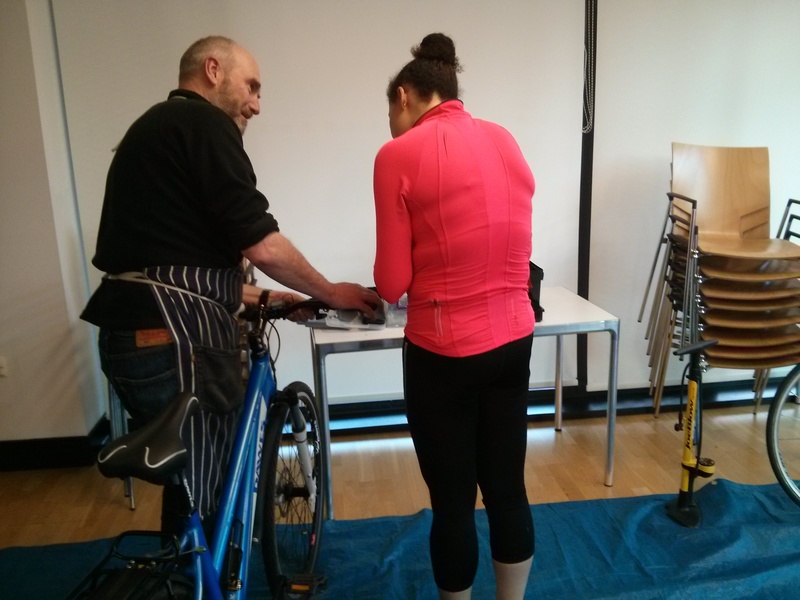 Workshop on 2nd March 2015, Kentish Town Health Centre. 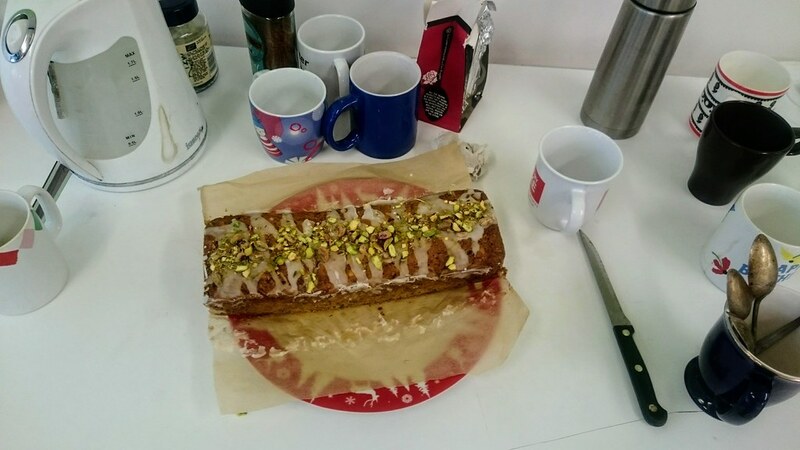 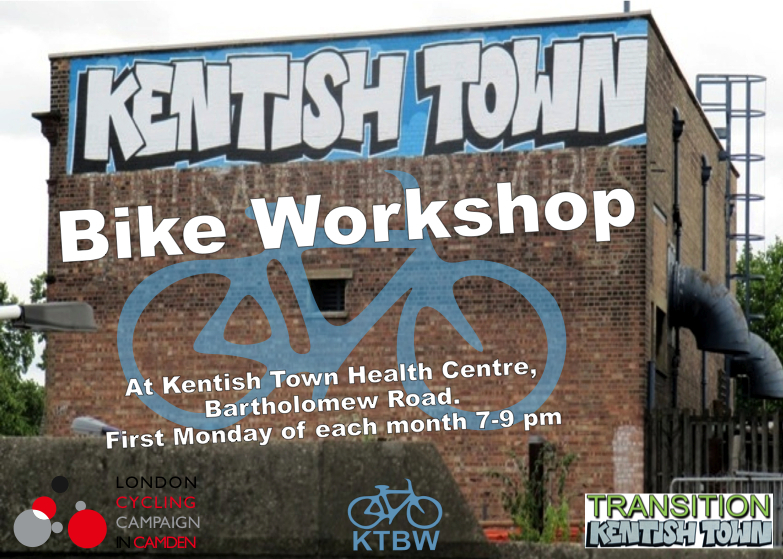 Workshop on 2nd February 2015, Kentish Town Health Centre. 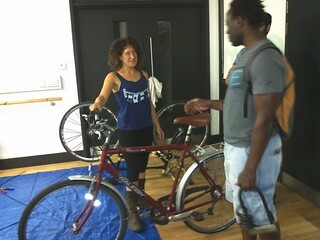 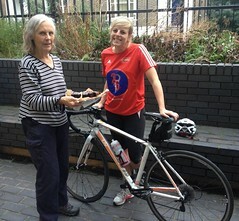 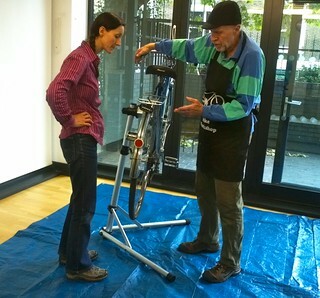 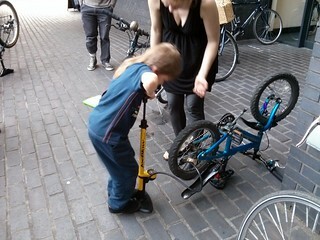 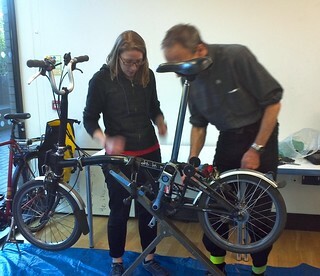 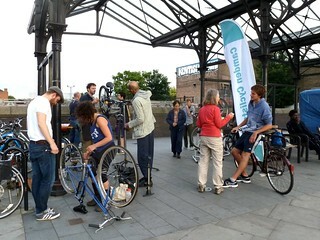 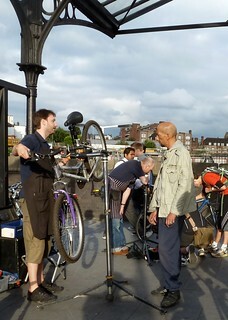 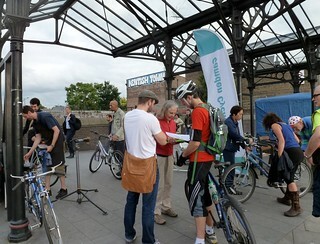 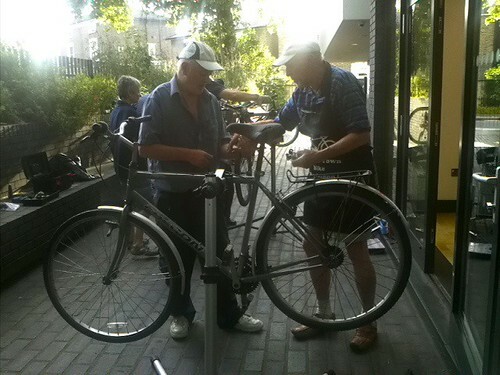 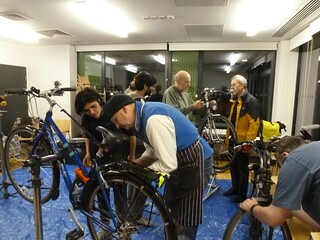 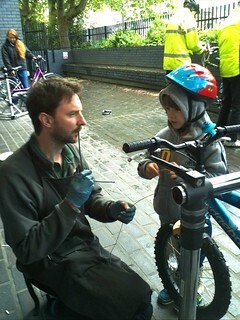 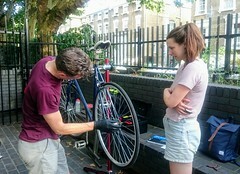 The first two workshops were held under the canopy outside Kentish Town Station in June and July 2012.